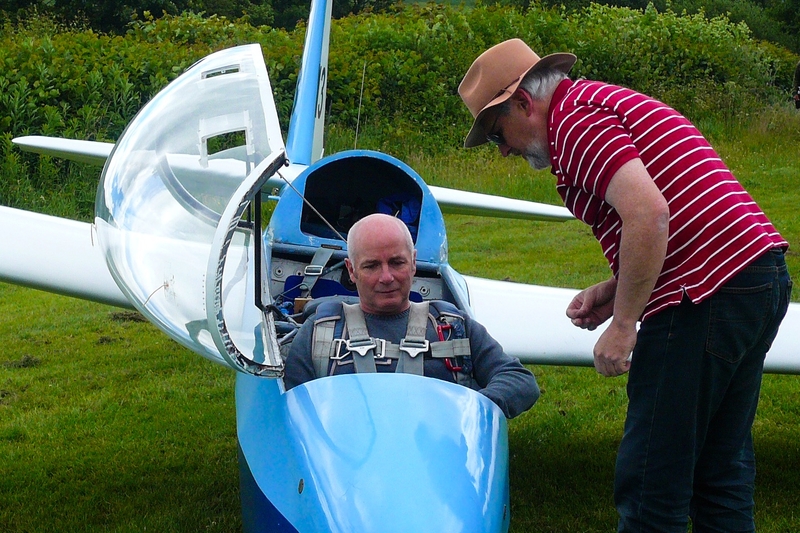 If you’ve often wondered what it’s like to fly a glider? Soaring silently above the Black Mountains and The Wye Valley? 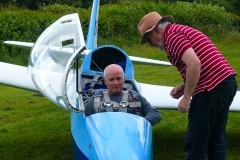 Then a Gliding Experience flight at Talgarth is just for you. Our experienced instructors typically fly around 400 people a year. 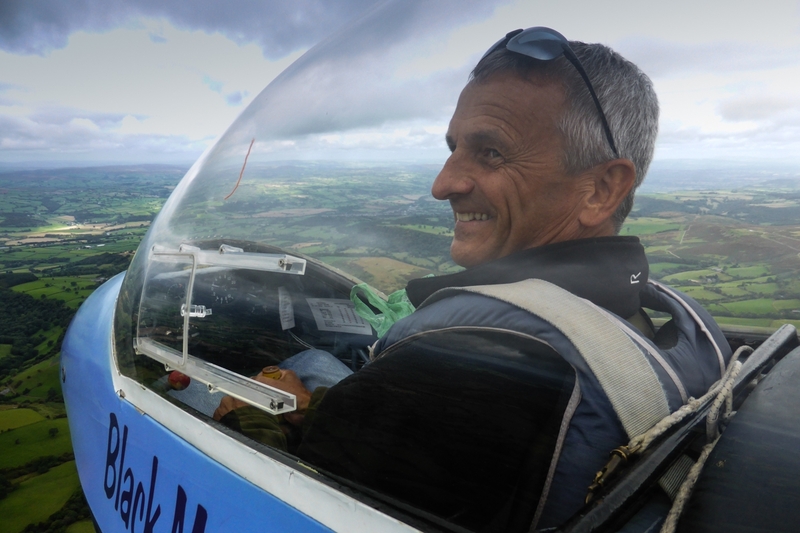 Talgarth is the ideal place to try this amazing flying experience. Read some of our reviews. You’ll take a flight in a dual controlled glider, with a qualified instructor. The glider will be towed up behind the tow-plane to a nearby hill or to 2000ft (dependent on conditions). You will fly within the Brecon Beacons National Park, and perhaps share a thermal with a buzzard or two. You may even see a red kite – several live nearby. The airfield is located in an idyllic setting, at the base of the Black Mountains, with panoramic views to the west. During the 20-30 minute flight you will be invited to take the controls. Your instructor will help you understand how the controls work and you will be able to fly the glider yourself. 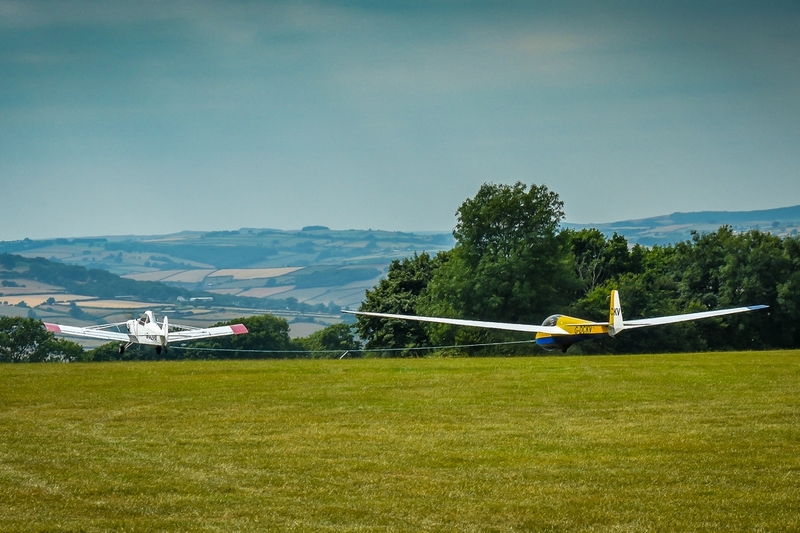 If you’re organising a group event or a corporate gliding experience you should read this. One aerotow flight with an instructor. You can expect to fly for 20-30 minutes, sometimes much longer if conditions permit. 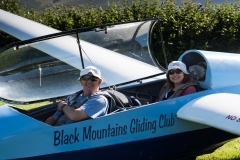 This option is for two people, and consists of a single gliding experience flight each, as described above with a discounted price. You can both expect to fly for a minimum of 20 minutes, sometimes much longer if conditions allow. 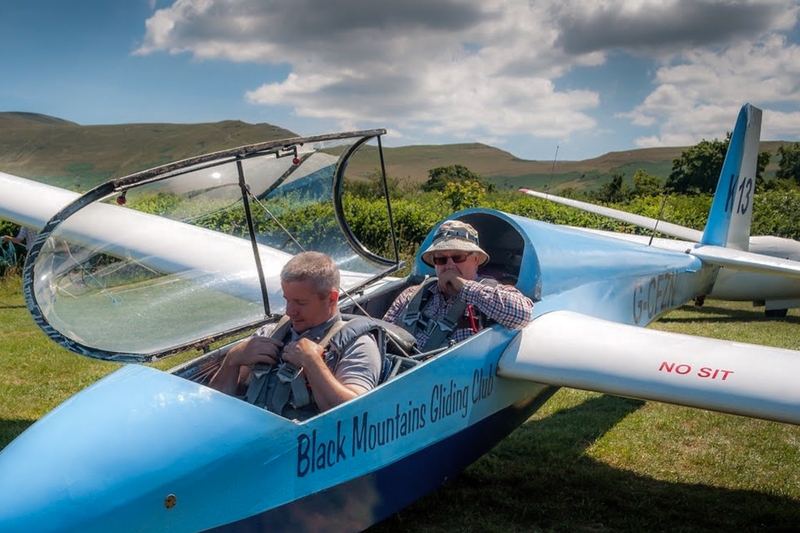 This amazing option allows you and your partner, friend, or colleague to fly on the same day, and afterwards, you can both compare your experiences of flying high over the Brecon Beacons. This consists of 2 flights with an instructor plus ground briefings. You will normally be the only pupil so will benefit from one to one attention. 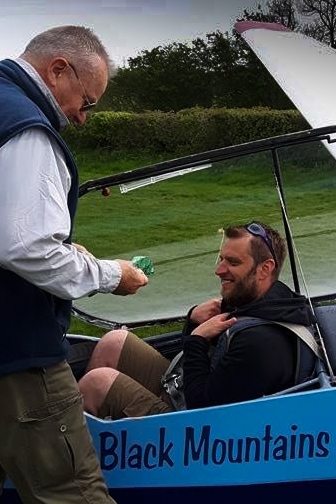 This is the ideal introduction to learning to fly a glider – an in-depth experience with about of 60 minutes of flying time, possibly a lot more in good soaring conditions. This consists of 3 flights with an instructor plus ground briefings. You will normally be the only pupil so will benefit from one to one attention. This is the ideal introduction to gliding – an in-depth experience with about 90 minutes of flying time, possibly a lot more in good soaring conditions. All Gliding Experience Flights, Gift Vouchers and Mini-courses include three months temporary membership and are valid for 12 months. Three months membership means you can book and fly at members rates. 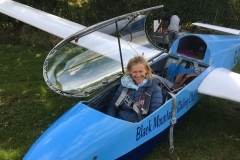 Our gliding experience/trial lessons and the mini courses can be purchased online – just click to buy with our secure server with your normal credit or debit card. Or use PayPal. A Flight Voucher will be sent to you, and you will receive a confirmation by email. If the Flight Voucher is to be a gliding gift to be in another person’s name, please note that on the PayPal payment review page, before you commit to pay, there is an option to add special instructions to the seller. You can leave any message here. Alternatively you can email the club with the details after you have purchased the gliding voucher online. If you want to buy more than one voucher, you will need to purchase these as separate transactions – there is no extra charge for this. if you have a PayPal account which is linked either to the card you wish to use, or to the email address you are using for this order – you will need to pay via your PayPal login. During weekday mornings you can book a trial lesson or mini course by phone and pay by credit or debit card. A voucher will be sent to you within a few days. If the voucher is a gift, please include the name of recipient to enter on the gift voucher. Just about anybody. But there are a few restrictions! Age : Young children are unlikely to benefit from a flight but many 13/14 year olds are able to absorb the flight and manage the controls. We have active pilots aged 70-80 years old and so, provided the person is not too frail, age is no real barrier. 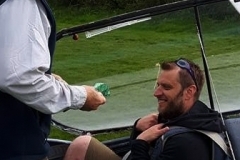 Size: A maximum weight of 16 stone is a safety limitation, and people over 6ft 4 inches will not fit in the cockpit. Fitness: Flying is not physically demanding. You should be able to get in and out of the cockpit and be able to sign a medical declaration. If you are under medication you may need to ask your GP for advice. You should not fly if you have a cold. Excellent for all the family. There are fantastic concessions for young people. Experienced,& carefull instructors. A great adventure for all ages. Once airborne...life takes on a whole new meaning... Don't miss it! 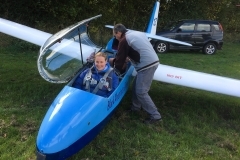 A taster gliding flight - highly recommend. Flights across stunning scenery. What a wonderful spot to try gliding. The team there are so helpful and reassuring I had a great time and the feeling up there is magical will definitely give it go again.